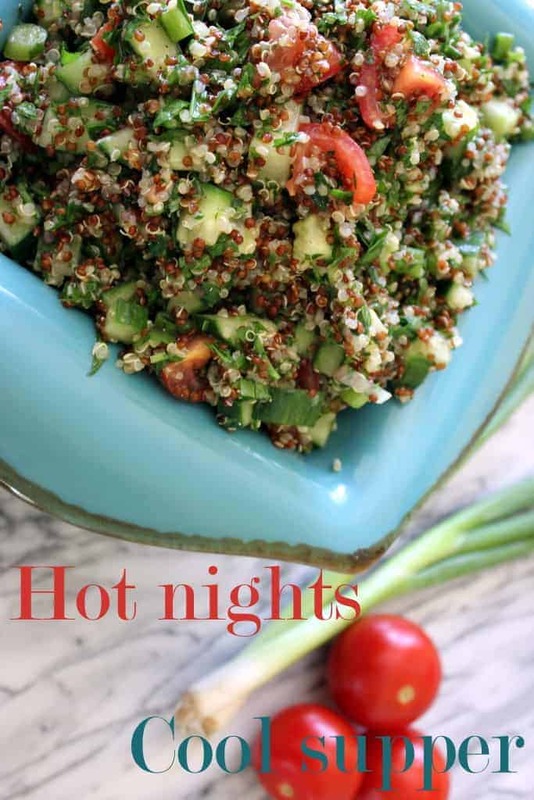 Need a great cold salad for a hot summer night? Add this Quinoa Tabbouleh to your go-to list. I looked at the weather map when I was reading the newspaper this morning and it was RED (meaning hot) practically all over the US of A. Summer is upon us and here in Cape Cod that means hot, muggy days and the occasional (blessed) thunderstorm. Nobody likes to heat up the kitchen in summer, and often times I find myself whipping up a cool but hearty tabbouleh salad, and passing a plate of something to grill over to the capable grill master. So it was last weekend–a simple, fresh and filling meal eaten outdoors for dinner one night, and again for lunch the following day. 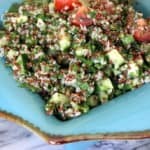 I love tabbouleh and before going gluten free I ate the wheat version frequently during the hot months. Last weekend I tried it for the first time with a mixture of red and white quinoa and it was perfect. It makes great use of the tomatoes, cucumbers and mint that seem to take over the summer garden. As with every salad, try to find the freshest possible ingredients. If you don’t grow your own tomatoes, pick some up at the farmers’ market. Nobody likes to heat up the kitchen in summer, and often times I find myself whipping up a cool but hearty tabbouleh salad, and passing a plate of something to grill over to the capable grill master. Bring 1 1/4 cups of water to a boil in a medium saucepan. Add the salt and the quinoa, reduce heat, cover and simmer for 10 minutes. Remove from heat and keep covered for an additional 5 minutes. Fluff with a fork and transfer to a serving bowl. While quinoa is cooking prepare the dressing. Whisk the juice from one lemon with the garlic. Slowly drizzle in the olive oil, while whisking, until the dressing is completely emulsified. Add salt and pepper to taste. Drizzle half of the dressing over the hot quinoa and set aside the remainder. After quinoa mixture cool to room temperature, add the cucumber, tomatoes, mint and parsley and toss well. Drizzle over the remaining dressing and toss again. Taste for seasoning and add more salt and pepper if necessary. I usually add the juice from one additional lemon at this point, because I prefer my tabbouleh on the tart side. Do it to your taste. Serve at room temperature or cold. This entry was posted in Quick & Easy, Recipes, Recipes & Techniques by Cooks We Love, Salads & Dressings and tagged A Girl Defloured, Alison Needham, autoimmune disease, celiac, celiac disease, celiac health, food allergies, g-free, g-free diet, gluten free cooking, gluten free food, gluten free recipe, gluten free summer recipe, gluten free tabbouleh, healthy eating, quinoa tabbouleh. Bookmark the permalink.